How wonderful that BATS will open the celebrations for their 60th year with such an effervescent zinger of a show! They’ve been very wise with their choice of production as Singin’ In The Rain has it all – wit, warmth and wonderful songs – and the talented members of the society make the most of its every moment. Their production wholly captures the spirit of the original 1952 film about the move from silent films to talking pictures in 1920s Hollywood. There is so much to appreciate: the skill displayed by the principals; the glorious dance numbers, including some irresistible tap sequences; the incredible 'wet set' complete with rain; the clever use of filmed inserts; the many laughs (which often come courtesy of the accomplished and industrious supporting cast); and the myriad costume changes. Bryn Hughes boasts a megawatt smile and phenomenal footwork as he brings matinee idol Don Lockwood to life whilst a brilliant Kirsty Bennett channels Miss Piggy and Betty Boop as his unfortunately voiced co-star Lina Lamont. Anneka Wass (Kathy Selden) and William Keel-Stocker (Cosmo Brown) are making their BATS debuts and are both fantastic, utterly nailing their characters. There’s also lovely fizzy chemistry between the leading romantic pair, the key trio and best buddies Don and Cosmo, helping to fully ignite numbers such as the sublime Fit As A Fiddle and Good Mornin’. A special mention must go to the ever-impressive Ian Moseley, who delivers both Beautiful Girl and a standout comic turn as the hapless Male Diction Coach in Moses Supposes. It must have been incredibly hard work for director Ray Jeffery, assistant director Nick Brannam, musical director Trevor Defferd and choreographers Julie Morris and Karen McCloy to put it all together, but it has absolutely been worth it. This winning show whets the appetite for what’s ahead in this landmark year (an Anvil concert on June 23 and Priscilla Queen of the Desert in November). Congratulations BATS and thank you for your key contribution to the artistic life of the town. May the best be yet to come. It's the Singin' in the Rain show trailer! Buy your tickets online at our Singin' in the Rain show page. Three pairs of tap shoes, a trilby hat, overcoat, a prop violin and an umbrella. The contents of Bryn Hughes’s rehearsal bag reveal the paraphernalia required when you’re the all-singing, all-dancing leading man in one of the best-loved musicals of all time – Singin’ in the Rain. Don is a Hollywood heartthrob from the 1920s, a star of the silent movies whose background as a song and dance man helps him make the transition to ‘talking pictures’. But it’s more of a struggle for his squeaky-voiced co-star, the demanding diva Lina Lamont. Bryn and the rest of the cast have been putting in the hours rehearsing the show’s spectacular musical numbers, including Good Mornin’, Broadway, Make ‘Em Laugh, Moses Supposes and All I Do Is Dream Of You. They’ve also had great fun filming the movie sequences for the show in the grounds of Worting House, just outside Basingstoke. But it’s the title number of the show – immortalised by Gene Kelly in the film version – that audiences will be intrigued to see. Will it really be raining on stage? And will Bryn be getting wet? “Yes!” says Bryn. “As the song goes, ‘I’m dancin’ and singin’ in the rain’ and that’s exactly what I’ll be doing! It's a clever piece of set design - you’ll just have to wait and see how we achieve it!" Singin’ in The Rain is at the Haymarket, Basingstoke from Wednesday 9th-Saturday 19th May. Performances at 7.30pm with extra 2.30pm shows on Saturday 12th & 19th. Will and Anneka take a break from rehearsal for a quick picture! That’s Anneka Wass’s view on performing in Singin’ in the Rain alongside her husband Will Keel-Stocker. Anneka plays aspiring actress Kathy Selden, while Will is vaudeville star Cosmo Brown, in BATS’ production of the classic musical about 1920s Hollywood struggling to cope with the introduction of 'talking pictures'. Both Will and Anneka have impressive musical pedigrees. Aside from his day job as a product design engineer, Will is a talented drummer who’s performed around the world, and a composer with credits including two songs for the recent Rosamund Pike film United Kingdom. Anneka is a member of the 1940s vocal trio Three Belles, who’ve performed at vintage fairs and even the Isle of Wight Festival. 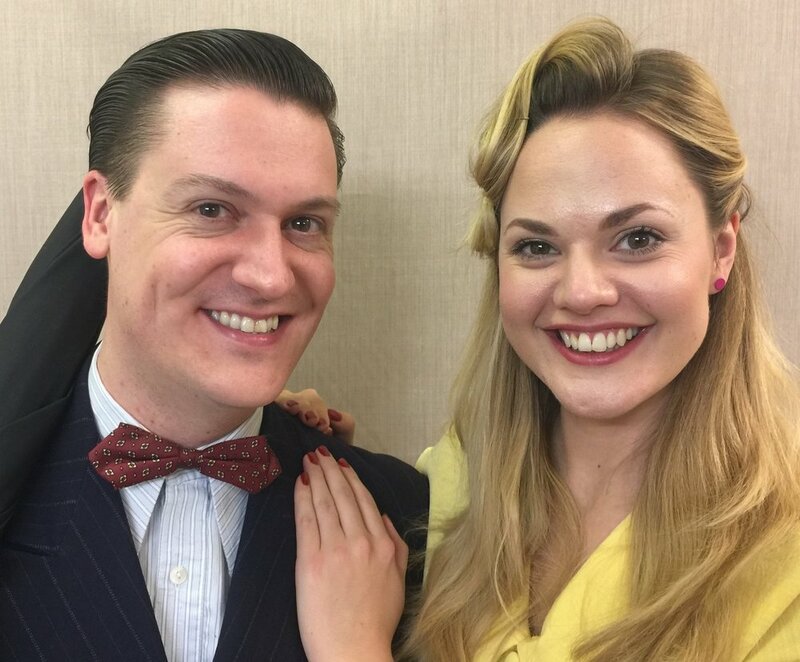 The pair first met gigging at Portsmouth University – but Singin’ in the Rain is the first time they’ve appeared together in a musical. The pair couldn’t resist auditioning as Singin’ in the Rain is their favourite film - one of the numbers from the show was also chosen for their first dance at their wedding! So performing in the show this May looks set to be a very special experience for this married couple – and one they’re loving every moment of bringing to the stage.